The paper industry uses very high volumes of process water for pulp preparation and bleaching among other processes. Water is needed to make paper pulp out of fibers such as cellulose, wood or recovered paper. If recycled paper is used a further stage is involved to remove the ink from the recycled paper. These processes collectively produce a significant amount of contaminated wastewater and sludge. On average for every ton of pulp produced in the production of paper approximately 17,000 gallons of industrial process water is required. This sets the paper and pulp industry at the top of the list for industrial consumers of fresh water and energy. With this excessive use of water and energy comes a great need for optimization of the treatment process. The wastewater produced by the paper production process contains sediments, effluent solids, absorbable organic halides (AOX), chlorinated organic compounds, chemical oxygen demand (COD), and biological oxygen demand (BOD) contaminants. The treatment of this wastewater requires onsite primary and secondary treatment systems. These systems when engineered correctly can dramatically reduce the water usage of a plant through reuse of treated water. Post wastewater treatment sludge is the next major issue to deal with as huge volumes of sludge are generated. Solutions for handling the treatment of paper and pulp wastewater include clarifiers and dissolved air flotation. 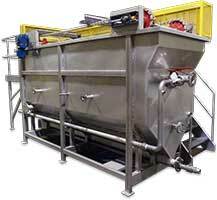 Sludge handling is best handle with a sludge dewatering system to dry the sludge and allow for incineration.